Present at the meeting were Charles Krauthammer, the Washington Post columnist and Fox News contributor; Paul Gigot, the Wall Street Journal editorial page editor; Robert Costa, the National Review’s Washington editor; syndicated columnist Kathleen Parker; and Washington Examiner columnist Byron York, according to a source with knowledge of the meeting. President Barack Obama met with a small group of conservative reporters, columnists and commentators on Tuesday for an off-the-record conversation. The private White House meeting last for 90 minutes in the Roosevelt Room, reports the Huffington Post. The chat followed an on-the-record exchange with the White House press corps about the government shutdown and imminent debt default, which lasted over an hour. Supposedly, the meeting was to woo conservative journalists, columnists and commentators. Except, these are the same ones he met with in 2009. The same who are at times on his side – the same that are not Constitutional Conservatives by any means. On more than one occasion, President Obama has quietly met with select members of the media. The off-the-record meetings were notable in that conservative journalists were seldom included. On Tuesday, the tables were turned somewhat as Obama invited a small number of conservative reporters, columnists and commentators to the White House for a private chat, but is the president looking for an edge in the ongoing budget impasse with Congress? The White House declined to comment on yesterday’s meeting. Krauthammer is brilliant, but when he gets it wrong, he goes all the way. I don’t know whether Obama will bend or not, but my gut says he wants this all to fail one way or the other. He hates America and wants her on her knees. He doesn’t give a crap about his legacy. Obama has met numerous times with opinion leaders, from newspaper columnists to cable news hosts, in order to get his administration’s point of view across in a private setting. The groups often include mostly liberal or moderate media figures. In August, Obama sat down with several members of the New York Times editorial board and some of the paper’s top columnists, including conservatives David Brooks and Ross Douthat. And Obama broke bread with several conservative media figures just prior to taking office in January 2009. That dinner, which took place at conservative columnist George Will’s house, included Krauthammer, Gigot, Weekly Standard editor Bill Kristol and National Review editor Rich Lowry. Obama presumably has more time than usual this week to field questions from journalists given that his planned trip to Asia was called off due to the shutdown. The Los Angeles Times reported Tuesday that the president has had to improvise his schedule, since many White House staffers are furloughed and there are fewer opportunities to hold events. 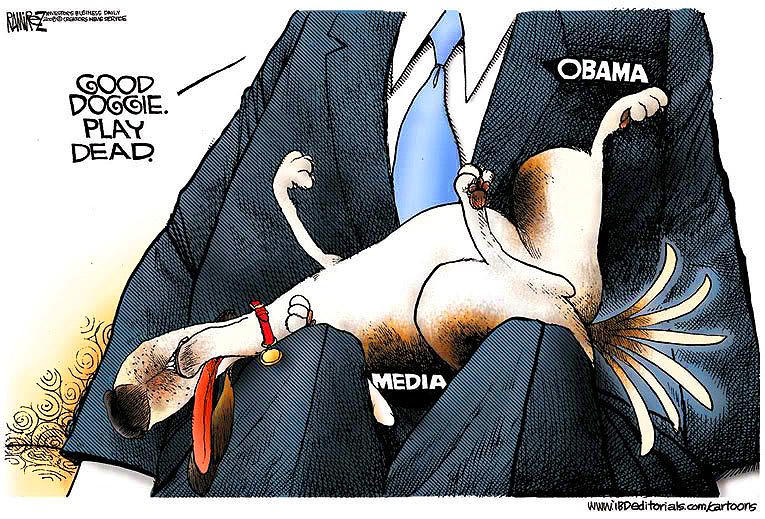 As a result, Obama has provided more access than usual to the press. You mean in between playing golf and partying he has more time to twist the arms of the media? Threaten them? Bribe them? Good to know. Obama is pulling out all the stops. He’s moved from nudging, to shoving and soon to shooting. He’s using unprecedented force against Americans. He has always gotten to the media and masterfully diktated the truth to them – they are his Marxist lapdogs eager to follow his lead and his orders into a new envisioned Progressive futuristic fantasy land. Summoned and soon commanded to roll over and play dead. Idiots of the GOP unite.